The Paws Pet Supplies was established to wholesale and dropship of high quality dogs and cats products. We focus on premium quality and well functional pet products which are safe to use for owners and animals. We welcome approaches from all sectors of the pet trade market, to share our success and to increase your revenues. Interested in carrying our products in your pet shop or on your website? Click here to register for a trade account or call us now on 01223 911889 to discuss your requirement. There is no minimum order value. We offer flat rate shipping on all UK wholesale orders and free shipping for orders over £150. All our products are dispatched from stock, typically within 24 hours. Find out more about our wholesale pet supplies service. You do not have to hold any stock. When your customer places an order with you, simply place your dropship order via your online trade account. We then pack and dispatch your order to your customer directly, in plain packaging. 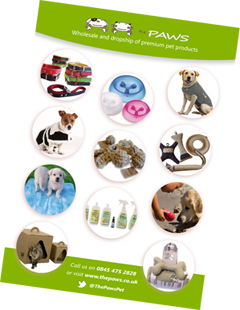 Find out more about our dropship pet supplies service.